Since planting its first vineyard in 1996, Malivoire has pioneered an innovative, eco-centric approach to wine growing. Intent study of the soil and climate of the Niagara Peninsula’s Beamsville Bench inspired the planting of carefully selected cool-climate grape varieties. Optimizing the topography of the Bench, Malivoire became the first in Niagara to guide wine from grape to bottle with gravity. Gentle, minimal handling is a signature concept in Malivoire’s quest for elegance and complexity in its wines. The hillside winery, situated in the middle of a sustainably farmed vineyard, adds natural drama. Elegant and authentic cool-climate Chardonnay has been a focus for Malivoire since its inception. The single vineyard Moira Chardonnay has been regularly cited as one of Canada’s top wines with a proven ability to age. Malivoire’s Mottiar vineyard Chardonnay has drawn similar accolades and offers a distinct terroir counterpoint to the Moira vineyard. Malivoire’s current annual production is 25,000 cases. 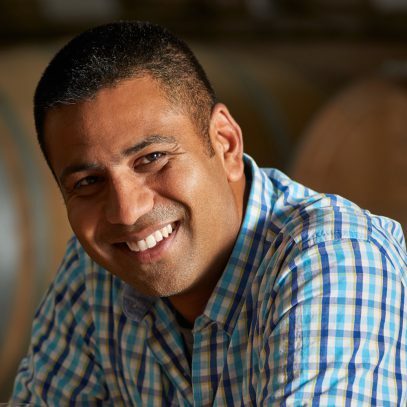 Ontario-born Winemaker Shiraz Mottiar has been an influential presence at Malivoire since its earliest days. An original graduate of Brock University’s Cool Climate Oenology and Viticulture Institute, Shiraz joined our staff in the summer of 2000. Within two years, after taking time out for a harvest sabbatical in Australia, Shiraz was promoted Assistant Winemaker. In 2005, he took full hold of the reins as Winemaker. Today, after more than a decade at the controls, Shiraz is the veteran pilot of Malivoire’s vineyard and vinification practices. Martin Malivoire was a believer in the cool climate style of wine from the beginnings of his winery in 1996. Informed by thorough study of the Niagara Peninsula’s Beamsville Bench, Martin identified and planted chardonnay and other cool-climate varieties that demonstrated the highest suitability to his vineyards’ soils and microclimates. The winery was built to enable gravity flow as a production tool. This reflected Martin’s conviction that gentle, minimal handling in the cellar engenders wines that speak most vividly of their origins. In his mind, and the mind of our Winemaker, the traits of cool climate chardonnays are vibrant fruitiness, clarity and minerality, with stylistic elegance, complexity and balance.